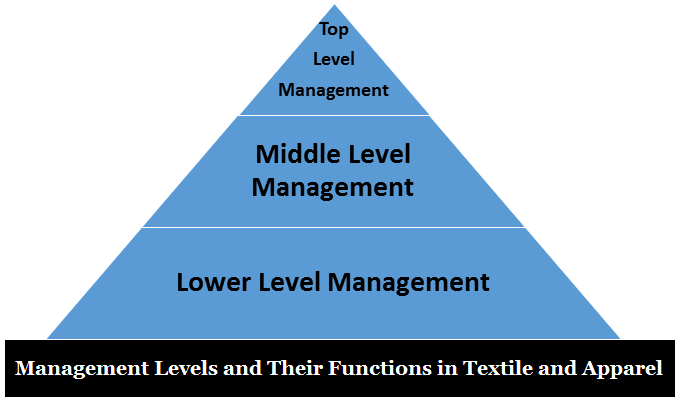 Home » Posts tagged "Management Levels and Their Functions in Textile and Apparel"
If you are involved with the apparel industry or you have an interest in working in any levels of management, then you must know the Management Levels in Garments Factory. When you clearly know the Management Levels and Their Functions in Textile and Apparel industry, you can easily decide who is responsible for what. Generally, you can find three levels of management in the Apparel Industry. Top level management has the Supreme authority and most of owning a share in a garments factory. Their designation titled as MD (Managing Director), Director, Chairman, CEO (Chief executive officer), COO (Chief operating officer). They are mainly responsible for setting company policy, objective, ethics and employee code of conduct of employees as their job role. Middle-level management is called executory level subordinate of senior management but above of lower level management. Generally, in the Textile and Apparel industry, their job titles are Production manager (PM), Executive officer, Officer, Manager etc. Company performance depends on Middle-level management. Lead low-level management /operational staff directly. Lower level management is in supervisory level, supervise worker directly. They also are known as operational staff who report directly to the mid-level management. In textile and Apparels industry their job title as Supervisor, controller and in-charge. Low-level management directly connected with work and ultimately responsible for company performance.